This being a day of leisure for me, I feel as if I must employ the time in talking to you, whom I have so long neglected seemingly, but not in reality, for it is seldom indeed that your image is out of my mind, always present in times like these, when I’m low in spirits, with scarcely a gleam of sunshine to lighten my weary way, on account of my present condition. Press is sick, and I am sick, nothing at all serious, but just enough to keep me despondent. Press has been afflicted for several days with the severest cold I ever saw, accompanied by a fever, loss of appetite and considerable suffering. I feared it was pheumonia, but the doctor says not. Mine is a very slight one, and need cause no uneasiness to you and Pa. I think it was brought on by over-exertion on the march form Winchester, and it has been aggravated by the subsequent exposure I have undergone. We have been at this place for ten days, and in comparative comfort. We are on the railroad to Richmond, though, and I could go by train. I wrote you by Regan from Culpepper. The next day I believe after he left, we started to this place on a forced march, to head off the Yankees. We succeeded in doing this, but the exertion and exposure were fearful. It had been raining before we started, and the road was wet and slippery, and the fatigue in marching was excessive, and you may imagine. the first day was bad enough, but the next was incomparably worse, for in addition to the wretched condition of the road, it rained steadily and hard all day long. Through this we marched as rapidly as was practicable. Many and the deep were the curses heaped upon the heads of our generals, for the men could not see the necessity of it, as they do now. If the days were bad, the nights were horrible, for most of the boys had no protection from the weather. The first two nights I had my little Yankee tent, but the last and worst night (the night we made Fredericksburg) I stood all night in the rain, for Press gave out, and I had to go without the friendly shelter of my little “fly. ?” My overcoat kept me as dry as a powder house through all the rain. The good it has done me already cannot be estimated in money. Since we got here there has been the only permanence in our camping arrangements since I joined the regiment two months ago. Our ground is regularly laid off, wells dug, etc., as if we intended staying some time. We are doing some very heavy entrenchment work around this place. 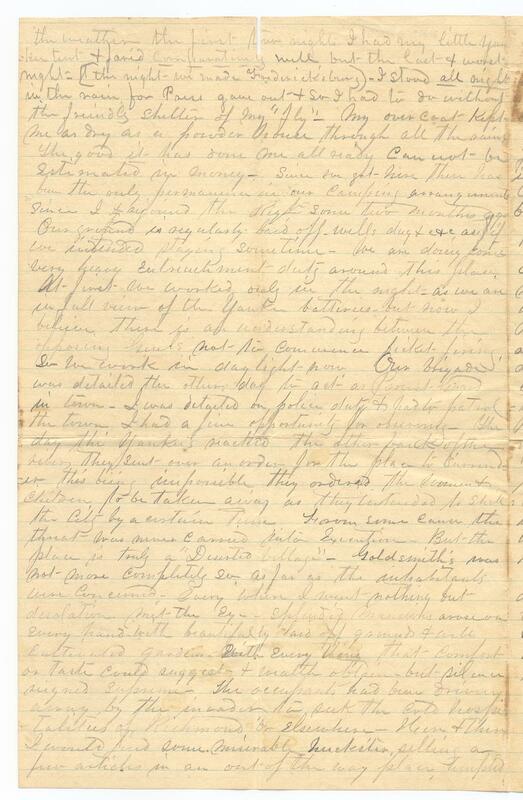 At first we worked only in the night, as we are in full view of the Yankee batteries but now I believe there is an understanding between the opposing generals not to commence picket firing, so we work in the daytime now. Our brigade was detained the other day to act as a Provost guard in town. I was detailed on police duty, and had to patrol the town. I had a fine opportunity for observing. The day the Yankees reached the other bank of the river they ordered the women and children to be taken away, as they intended to shell the city by a certain time. From some cause the threat was never carried into execution, but he place is truly a “deserted village.” Goldsmith’s was not more completely so, as far as the inhabitants were concerned. Everywhere I went nothing but desolation met the eye. Splendid mansions were on every hand, with beautifully laid off grounds, and well cultivated gardens, with everything that comfort and taste could suggest and wealth could obtain, but silence reigned supreme. The occupants had been driven away by the invader, to seek the cold hospitality of Richmond and elsewhere. Here and there I would find some miserable huckster selling a few articles in an out of the way place, tempted by greed of gain to brave the Yankee shells. While in town we were quartered in the market house. After a twenty-four stay we returned to camp. We have large “flys” now for our protections, and with one stretched over us, and a good supply of straw under us, we feel very comfortable indeed. My Yankee tend I have stretched by the side of ours, supplied with straw, and closed up at the north end, for Press and McGowan’s boy. They are comfortably fixed with blankets. So you see we are not uncomfortable while we remain here. Our “feed” is of next importance. Rations consist of flour and beef, never anything more, but you would be astonished to see how well we get on with these two articles. We make tolerable biscuit of flour, water and salt alone. The method of cooing the meat depends on the piece we draw. It is either baked or steaked nearly all the time. Sometimes we have a pot of soup. Eldridge Mumford ( am messing with him and Stewart of Dry Grove) is an elegant hand on a steak, while I consider myself without an equal in making;- the gravy is a main consideration in both preparations. The day before the people left town I send Press in to get something to eat. He succeeded in getting some rice, lard, pepper, sugar and coffee (?). While this lasted we lived finely. Press does very well in cooking anything, but he always acts under instructions. Were he well I should have a big pot of lye moniny made, and also get some beef feet from the butcher pen, and make calf foot jelly. Some of the boys succeeded finely on the latter especially. Press and I are tolerably well provided with clothing. Both have a change of underclothing. I gave him my coat and the two pairs of socks I carried to Winchester, and my Rebel pants, while he got an extra shirt when he got his carpet sack at Culpepper. Billie Pool has just returned from Richmond. He found the trunk I first started with, and brought me therefrom one gray overshirt, one red flannel shirt, one blanket undershirt and two pairs of woolen socks. The blanket undershirt I gave to Press, also the socks I had with me, keeping the new pair. Press’ shoes and hat are good. My shoes are good yet, but begin to show evident signs of dissolution, and you must hurry and send me a pair by the first opportunity. Also get some jeans and make me an overshirt and pair of drawers, pair of gloves, comforter or helmet, and a pair of socks or two. I can’t tell what has become of the small trunk. It is not where I left it, but my large trunk was in its place. When I saw Jesse Thompson at the Winchester I gave him my key, and requested him to get both trunks, put everything in my little trunk into the big one, and carry the small one home. My large trunk is (?) , and I fear he has misunderstood my directions and taken the little trunk home and all its contents. I cannot imagine how the thing has been managed; – all I know is that someone has managed to leave me without any resources whatever. If it had been as I directed I would be plentifully supplied with clothing. Better it had not been disturbed at all. Find out from Jesse what he did, and let me know immediately. I bought a nice pair of pants and jacket and two pairs of drawers form the government. 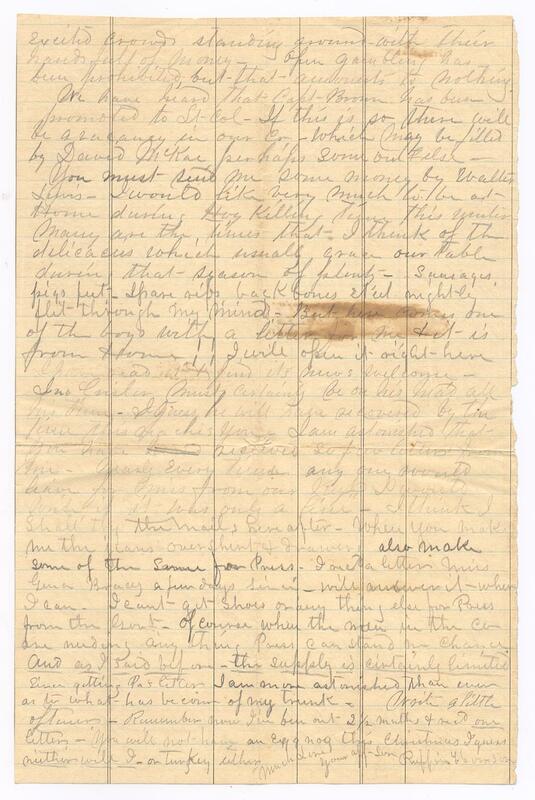 We have had a limited supply of clothing, shoes and blankets brought in to us from the quartermaster’s department, not enough however; and I fear the supply has given out, for an order was issued the other day that barefooted men would no longer be excused from duty, as they could make moccasins from beef hides. I forgot to say you must not forget the leggins. The pair I brought have been of incalculable service to me. 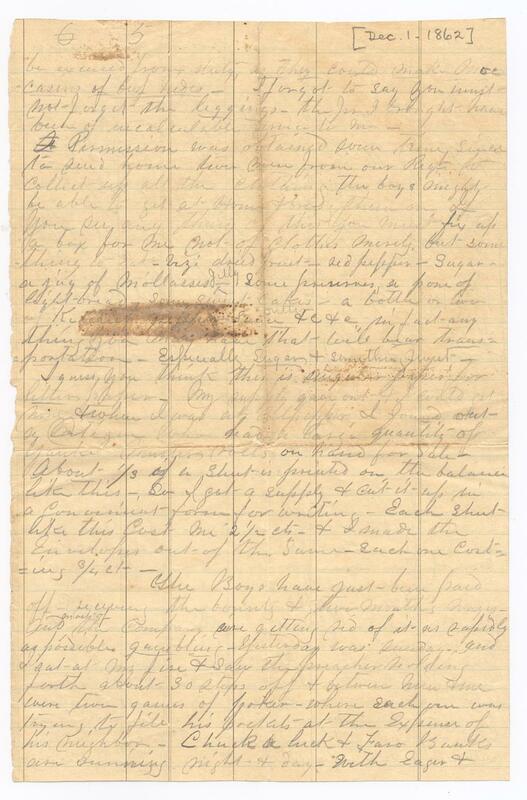 Permission was obtained sometime since to send home two men from our regiment to collect all the clothing the boys might be able to get at home, and bring them on. If you see anything of this you must fix up a box for me, not of clothes merely, but something to eat, viz. : dried fruit, red pepper, sugar, a jug of molasses, jelly, some preserves, a pone of lightbread, some sweet cakes, a bottle or two of ketchup, pepper sauce, etc., etc., – in fact anything you may have that will beat transportation, – especially sugar and something sweet. They boys have just been paid off, receiving the bounty and two months’ wages, and most of the company are getting rid of it as rapidly as possible gambling. Yesterday was Sunday and I sat at my fire, and saw the preachers holding forth about thirty steps off, and between them and me were two games of poker, each one was trying to fill his pockets at the expense of his neighbor. Chuck-a-luck and faro banks are running night and day eager and exciting crowds standing around with their hands full of money. Open gambling has been prohibited, but that amounts to nothing. We have heard that Captain Brown had been promoted to Lt. Colonel. If this is so there will be a vacancy in our company which may be filled by David McRea, – perhaps someone else. You must send some money by W— L—. Would like very much to be at home during hog-killing time this winter. Many are the times that I think of the delacacies that grace our table during that season of plenty – sausages, pigs feet, spare- ribs, back-bone, et al. nightly flit through my mind. But here comes one of the boys with a letter fro me, and it is from home!!! I will open it right here. I have read it and find the news welcome. J— C— must certainly be on his head all his time. I guess he will have recovered by the time this reaches you. 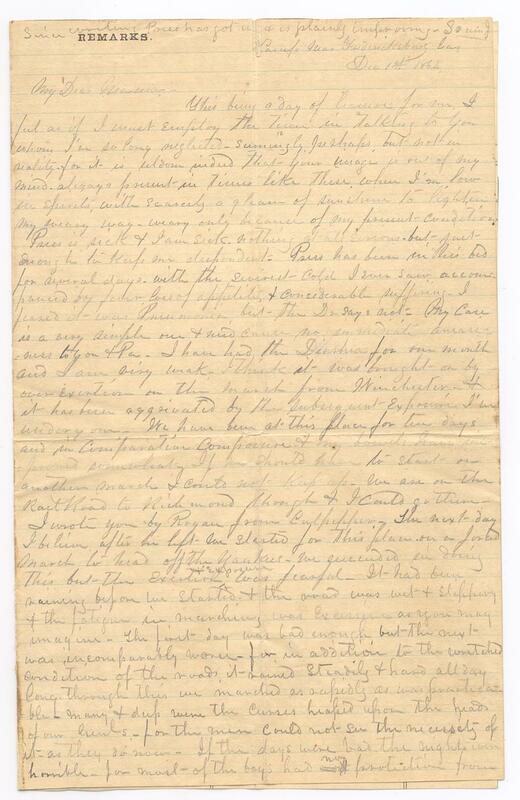 I am astonished that you have received so few letters from me. . Nearly every time anyone would leave for Mississippi from our regiment I would write, if it was only a line. I think I shall try the mail hearafter. When you make me the jeans overshirt, also make the same for Press. 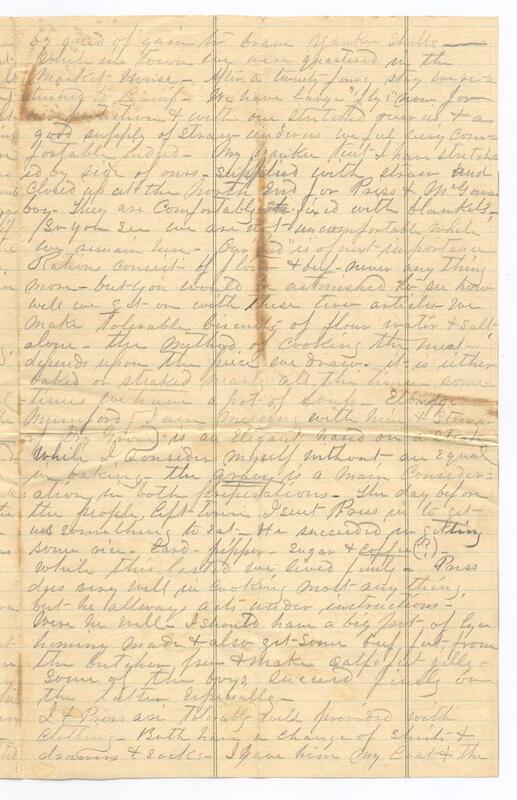 I received a letter from Miss G— B— a few days since – will answer it when I can. Of course, when the men in the comany are needing anything Press can stand no chance, and as I said before, the supply is certainly limited. Since getting Pa’s letter I am more astonished than ever as to what has become of my trunk. Write a little oftener. Remember I have been out eight and and a half months, and have received one letter. You will not have and eggnog this Christmas – neither will I – or turkey either. Since Writing Press has gotten up, and is plainly improved. So am I. 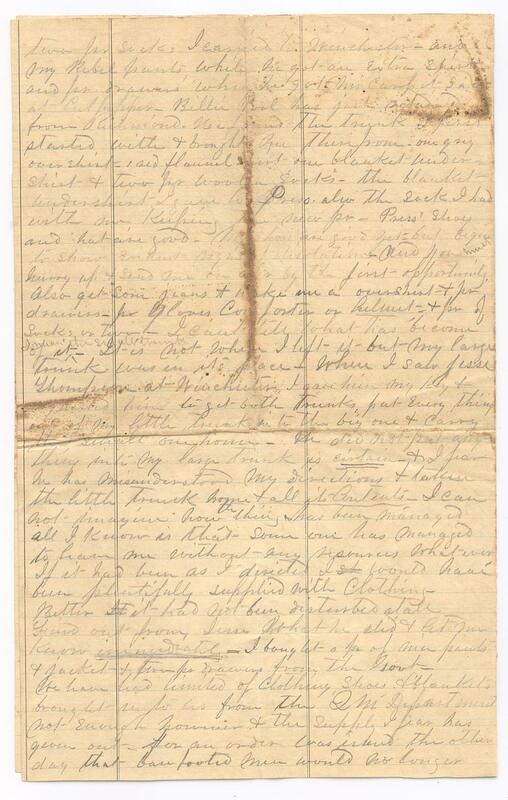 This entry was posted in Southern Historical Collection and tagged 18th Mississippi Infantry Regiment, body servants, clothing, Mississippi, Preston, supplies, University of North Carolina. Bookmark the permalink.